The new century need not be a sterile environment. There is plenty of room for greenery and a garden. In a rush for the perfect home automation system, people tend to think in terms of high-tech. So it is no surprise that when talking about air purifying systems the conversation tends to lead towards the latest dehumidifiers, closed HVAC systems and some other cool garden gadget. We forget mother nature’s chlorophyll factories and lose focus on the garden and the plants that can bring fresh air and color to our lives. A garden need not be complicated. There are high-tech solutions to growing a garden that even the person with the least capable green thumb can take advantage of. 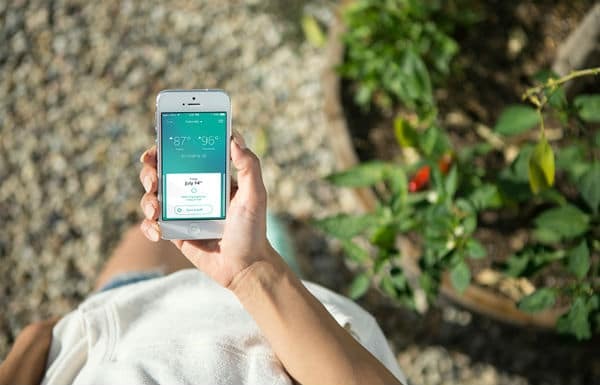 Here are five emerging garden gadgets that can automate any garden. Hydroponics garden in a small container; that is the best way to describe Plantui. Not every home or apartment is conducive to plant growth. Either there are not enough windows or the windows that are there do not offer enough sunlight. That is no longer a problem with this garden gadget. Using hydroponics, your plan will not need soil. The device monitors the light source and nutrient solution, so your plant is given optimum amounts of both. The light changes color when water and nutrient need to be added, so the guesswork in this garden is taken out. Click Grow knows how your garden grows! Not everyone has a green thumb. There are those that can kill a plant faster than many can water one. With the sleek design from Click and Grow, the brown thumbs can go green. This garden gadget comes in a single grow apparatus all the way up to one that can hold 51 plants. The choices of plants that it can grow spans herbs to other edibles. They even have the option of buying the empty grow pods to experiment with your own seeds. The device is simple to use. Merely insert the pod, fill the water to the preset level and let the machine control everything from watering and lighting. Your Basil just sent you an email. Imagine if your Basil could send you an email when it was time to water it? Or how about if your tomatoes are thirsty, they tell the garden hose to give them a drink? With Plantlink that is possible. What sorcery is this you might be asking yourself. It is simple really, you assign a plant name and a species identifier to the sensor that you put in the ground next to the plant. The sensor uses information that plants of that species are best grown in and can send you a text message or email when they need water. THe system even has devices that can control the watering source. So it has the ability to set watering schedules. Even better, if you have Iris or Smarthings, Plantlink will interface so you have one less thing to worry about in your home automation system. Getting a green thumb has never been so easy! Overwatering or underwatering remains the most common cause of death for houseplants. Forgetting that they are there probably kills more plants than large-scale deforestation. There is no short-term solution for deforestation, but you can solve your watering problem in your home. The Parrot Pot’s four built-in sensors monitor light, temperature, soil moisture and fertilizer levels in real time. Sends out customised recommendations and alerts to help you better care for your plant. Even if you leave for a short holiday, you can be assured your plant will still be amongst the living when you return. If you do not want to grow edibles and want instead focus on a mini biosphere, then Biopod is for you. This has a lot in common with the terrariums that were popular into the 80s, but more hands on. Like a terrarium, you can plant almost any exotic plant you choose. However, in this one, you can use modern technology to control lighting and water to make it more hands on. Suppose you want to create a natural habit for your pet snake or iguana, this can make your goal happen. The system also offers suggestions in planting and fauna to customize your Biopod and achieve maximum results. The amazing thing about modern DIY home automation is that it can make your home as hands-free as possible. Do you have some DIY garden gadget? Tell us in the comments! Google Home Is Finally Official!